A quiet night inside the Brown Lantern Ale House. Thought we’d be on our way by now, but find ourselves still taking care of things in order to get the boat ready. And, while we continue with our preparations, it hasn’t been convenient to cook on the boat…so we’ve been eating out for dinner. Brown Lantern’s hamburger and fries, with a tasty Mac and Jacks beer. Great meal! 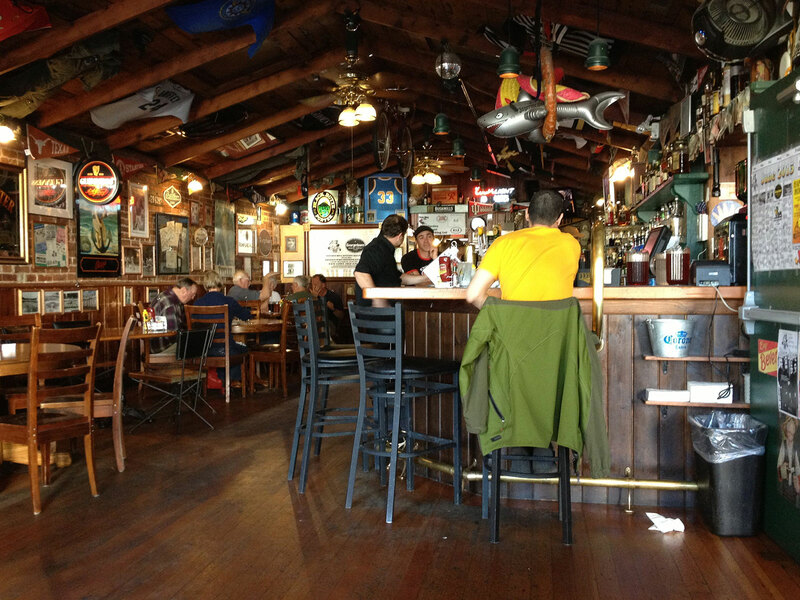 The Brown Lantern Ale House is one of our frequent haunts in Anacortes. Great pub food! We had hamburgers this time. Brown Lantern’s burgers are made with fresh ground chuck and served with lettuce, tomato, pickle, onion, mayo, and alehouse fries. They have Mac and Jacks beer on tap and it’s our favorite. Yummy! 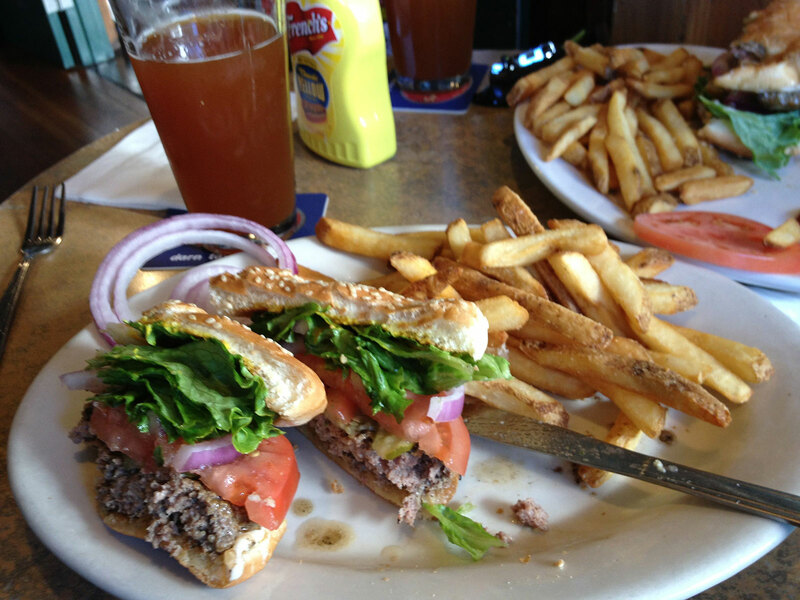 We think they have the best burgers in Anacortes. On Saturday, we had dinner at Anthony’s in Anacortes. The restaurant overlooks the marina at Cap Sante and has lots of windows that offer a pleasant view of the boats. Saturday was our actual anniversary date, so it seemed appropriate to go out for a nice meal. We can celebrate again at Dent Island when we get there. 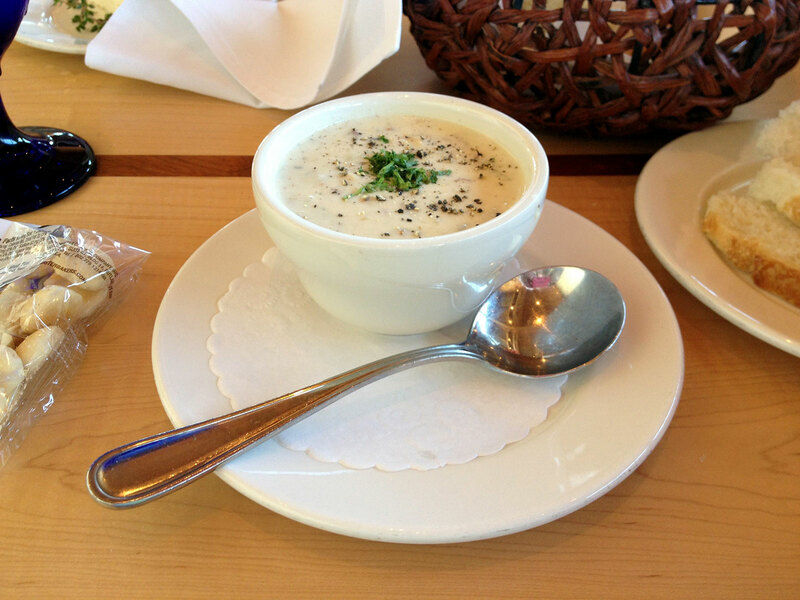 Meanwhile, we enjoyed the open, friendly atmosphere at Anthony’s, and both had a cup of their excellent chowder (reminds us of the chowder we used to have at Duke’s on Lake Union) and an elegantly-prepared crab salad. Most excellent! What a nice evening we had for our dinner at Anthony’s! This is the view from the walk outside the restaurant, looking out over the Cap Sante Marina. We both had a cup of Anthony’s chowder. Very tasty! 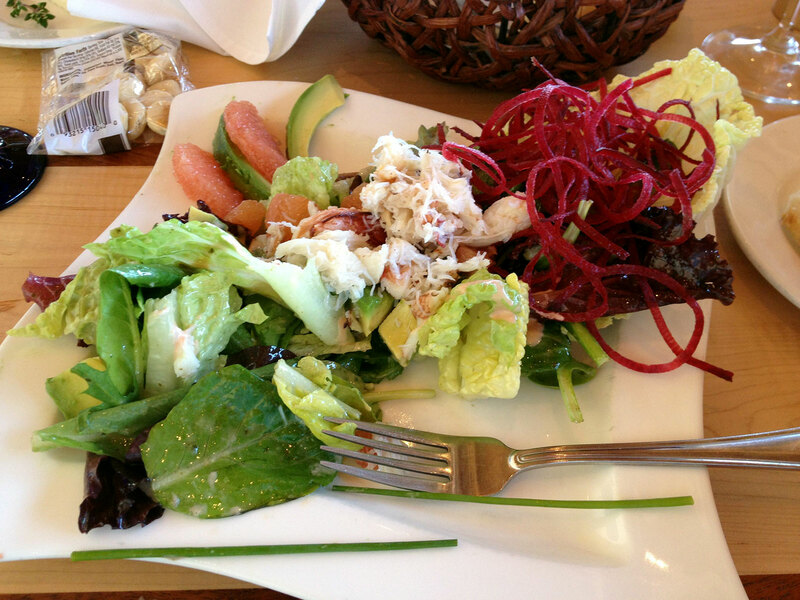 The crab salad at Anthony’s had good flavor and the arrangement on the plate was quite elegant. We also stopped at Rockfish Grill one night…a quick stop when we got a late start for dinner, so we sat at their bar. Jim had one of their hamburgers and I had their San Juan Salad. A band was setting up for the night’s entertainment, but we finished before they started. Otherwise it can be pretty noisy in there and hard to talk. We’ll get back to preparing meals on board once we get the boat organized! 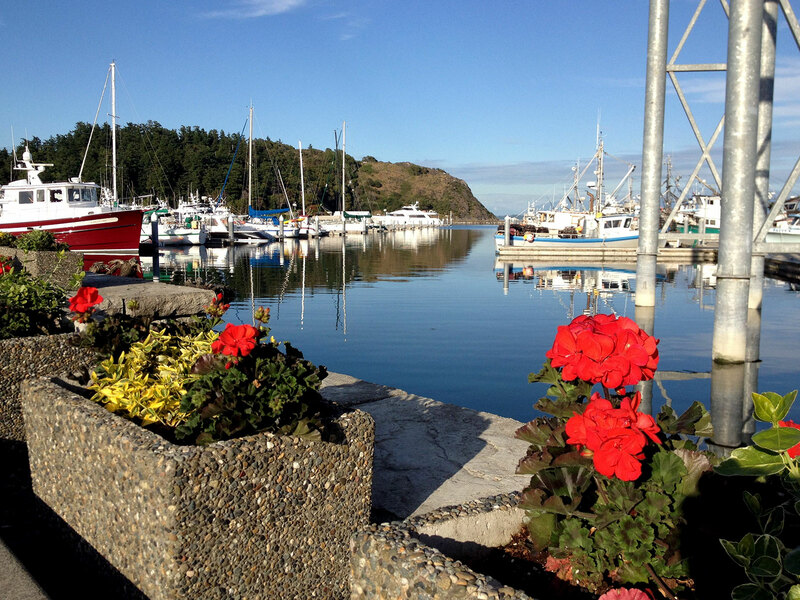 This entry was posted in Cruising, Food, Life Aboard and tagged anthony's at cap sante boat haven, Brown Lantern, cap sante marina, dinner in Anacortes, Rockfish Grill by Sailor Lady. Bookmark the permalink. That looks like a fun place. Such a shame you can’t cook….how you are off soon so you can! Yep, we’ll soon be back to cooking dinners on board. Most of our provisions are now on board and will be put away soon. We’re checking weather and tide conditions this morning and may leave today or tomorrow. Thanks for your note! Oups, that how should have been “hope”. Great photos, makes me hungry.